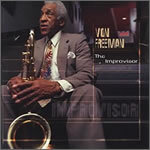 It’s an already implausible story, this saga of Von Freeman, the iconic Chicago saxophonist who created a unique and captivating tenor style in the 1940s and 50s; labored in the shadows throughout the 50s and 60s; led his first recording in 1972 at the age of 49, a couple more in the next several years, and then nothing more for a decade; and who – in his 70s and playing better and stronger than ever – began a series of albums that have made him a cover boy in jazz magazines, a much-demanded performer at festivals the world over, and the recipient of a mayoral proclamation (with a street named for him), as well as a doctorate from Northwestern University, at the age of 80. 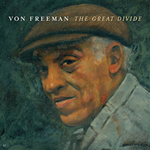 But even in the already implausible story of Von Freeman’s “post-retirement,” his 82nd year on the planet holds a new surprise and delight: The Great Divide, which matches him to a sympatico rhythm section anchored by his contemporary, drummer Jimmy Cobb (whose resume includes his work with Sarah Vaughan and the Miles Davis Quintet and Sextet of the 1950s – the groundbreaking band that recorded Kind Of Blue). The Great Divide also features Richard Wyands on piano and John Webber on bass, and it marks the first time since Freeman’s brief stay in New York, in the late 1940s, that he has surrounded himself with musicians from the jazz capitol. 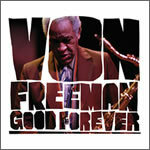 On such tunes as “Never Fear” and “Disorder At The Border,” Freeman responds to Cobb’s crisp strokes and precise beat with a combination of Chicago power and New York cool. On the other hand, the mysterious and haunting “Chant Time” finds Cobb showering the music with shimmering cymbals before a climactic solo on toms; add in the subtle shadings of Wyands’s piano (underscored by Webber’s lockstep bass), and Freeman has an eclectically textured canvas on which to work his magic. Meanwhile, the two long standards “Be My Love” and “This Is Always” find Freeman on familiar ground but nudged along different paths, as the New Yorkers bring the Big Apple’s unparalleled polish to the music. And that explains the subtext, too. Throughout the album, it is the frisson of these worlds colliding that places Freeman’s music in a different light, and even affects the music he makes. The “great divide” between jazz in New York and jazz in Chicago – in fact, between New York and everyplace else – looms in the background. And it connects directly to the overriding question about Von Freeman’s implausible career: What if he had moved to New York? What if he hadn’t remained in Chicago while his schoolmates and bandmates – Gene Ammons, Johnny Griffin, Clifford Jordan – headed east? Would he then have remained “undiscovered” into his 70s? 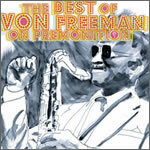 Von Freeman would tell you that he wouldn’t have changed a thing, and many others would agree that his sound and style developed because of where and when and even how he has lived – that his unique approach to the instrument might never have developed in the hothouse atmosphere of New York. But The Great Divide raises the issue again, and with exquisite results. Born Earl Lavon Freeman on October 2, 1922, on the South Side of Chicago, Von (or "Vonski," to use his universally known nickname) grew up in a musical household that also gave us his younger brothers George, a well-known Chicago guitarist, and drummer Bruz, who retired from music in the 1960s after a series of records on Contemporary with the Hampton Hawes Trio. As a toddler, Von heard Louis Armstrong – not in a dance hall but in his own living room, when Armstrong (a family friend) would come to visit. Fats Waller also visited the Freeman household. To this day, Von will point at the beat up piano in his living room and say, “Fats Waller played that piano.” At age 6, Von broke the horn off his father’s Victrola, pieced it together with a wooden mouthpiece, and started wailing into his very first “saxophone.” His father relented (if only to protect his prized Victrola!) and bought young Von a real instrument; by age 12, he was playing in a nightclub in Gary, Indiana, sporting a large hat to cover his youthful features. He turned down an offer from Earl "Fatha" Hines to stay in school, where he would learn even more about music than if he’d gone on the road with Hines. Von attended DuSable High School, where he studied under the famed band director and educator Captain Walter Dyett – whose instruction and discipline Von credits to this day. In the early 1940s, he performed with Horace Henderson's Orchestra before heading off to the Navy – where he took part in the “Great Lakes Experience,” the military’s historic experiment in desegregating the armed services through music by preparing black bands to perform for white sailors. 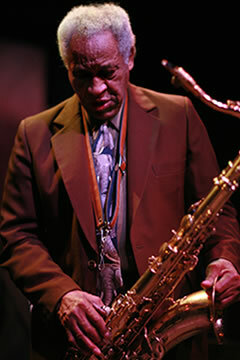 Von moved to New York in the mid 40s, but he soon returned to Chicago, where he and his brothers played in the house band at the Pershing Ballroom, backing visiting jazz greats that included Charlie Parker and Dizzy Gillespie; eventually, he led his own groups, giving early exposure to rising stars Ahmad Jamal, Andrew Hill, and Malachi Favors. In addition, he was a founding member of the first “Arkestra” assembled by visionary Sun Ra in 1948 (although he never recorded with the band). In the 50s, Von built an underground reputation as one of the city’s most accomplished but unusual saxophonists, with a sound just as big as you’d expect from the Chicago “tenor school,” but displaying a radically different sonority. He also built a reputation as one of the hardest-blowing tenor “battlers,” and locked horns on disc with Dexter Gordon, Willis "Gator" Jackson, Buck Hill and Teddy Edwards. 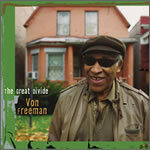 Remaining in Chicago to raise his family, Von played in a wide variety of venues at home – from Calumet City strip clubs to southside blues bars to northside jazz clubs – before establishing his ongoing Tuesday night jam session at the New Apartment Lounge, on a block of 75th Street renamed “Von Freeman Way” in 2002. These sessions have become a beacon for aspiring musicians; among those to have “graduated” (with honors) from the New Apartment are saxist Steve Coleman, multiple-Grammy-nominated vocalist Kurt Elling, and Von’s own son, saxist Chico Freeman. In the last several years, Von has also enjoyed a deepening friendship with the acclaimed young pianist Jason Moran, who appears on his previous Premonition release, The Improvisor. 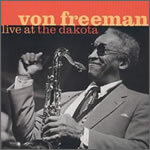 The DownBeat Magazine cover story on Von that appeared in early 2001 helped create a new round of publicity and excitement about this ageless wonder’s music; recent events have included his 80th Birthday Concert at Symphony Center, a birthday tribute at the Chicago Jazz Festival, his honorary doctorate from Northwestern, and a Chicago “Heroes” Award presented by the National Academy Of Recording Arts & Sciences. The highly anticipated release of The Great Divide will take its place among these accomplishments. For Von Freeman, apparently, life begins at 70 – and really starts to move at 80. Michael Friedman at mike(at)premonitionrecords(d o t)com.